This place is "a-MAZE-ing", huh? 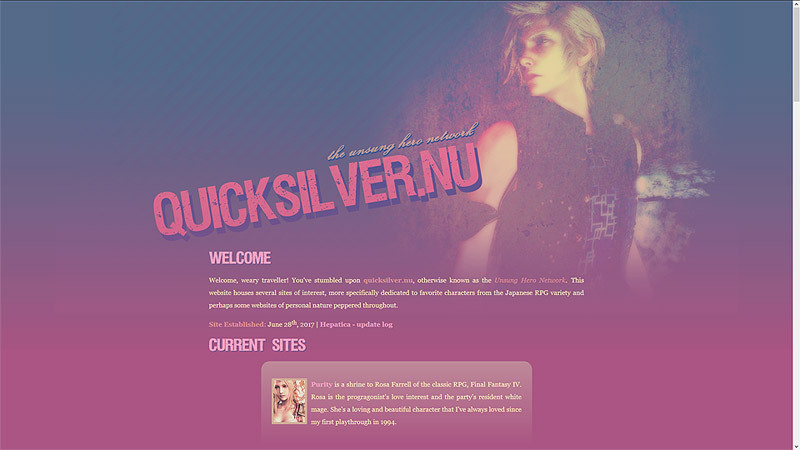 Quicksilver.nu was purchased in June of 2017 as I had the desire to put my websites back online and begin making character shrines and fanlistings again. Although I still had one of my old domains that I've used previously, I really wanted something fandom-related. The name Quicksilver comes from Prompto Argentum of Final Fantasy XV's namesake (literally, Quick and Silver) as well as one of his weapons later in the game. I'm really obsessed with FFXV as well as Prompto at the moment. Beyond that, it just sounds cool. Though it's not as cool as Valkyrie was. I am still salty at Godaddy for no longer carrying .nu names and being unable to renew it. I needed something with more room to display content and expand. This layout features art of Prompto and some geometric designs. The background is from Patterncooler that I modified a bit into a gradient and css for everything else. Version one was something stupidly simple that I threw together to put a list of my sites back online. It looked janky and cluttered toward the bottom but it served it's purpose.